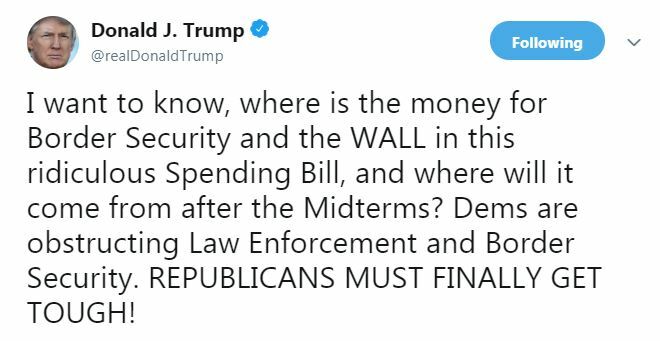 (CNSNews.com) - "I want to know, where is the money for Border Security and the WALL in this ridiculous Spending Bill, and where will it come from after the Midterms? Dems are obstructing Law Enforcement and Border Security. REPUBLICANS MUST FINALLY GET TOUGH!" Trump tweeted on Thursday morning. None of the three 2019 "minibus" appropriations bills either passed by Congress or making their way through Congress includes the $18 million for a border wall President Trump requested in his Fiscal 2019 budget plan. The $854 billion Defense-Labor-Health-Education bill passed by the Senate on Tuesday includes a continuing resolution through December 7, 2018, for any appropriations bills not enacted before October 1, 2018. "Until the porous borders are closed to the criminals, terrorists, and gang members that exploit it, America remains at risk. Furthermore, since most of the illegal drugs that enter the United States come through the Southwest border, a border wall is critical to combating the scourge of drug addiction that leads to thousands of unnecessary deaths. The border wall would stop smugglers in their tracks and help make America safe." President Trump's various campaign rallies routinely erupt in chants of "build the wall!" It was a signature promise of his presidential campaign, but congressional Republicans, including Senate Majority Leader Mitch McConnell (R-Ky.), have said they want wall-funding to wait until after the election. Following a meeting at the White House earlier this month, Senate Majority Leader Mitch McConnell (R-Ky.) told Fox News there's no chance of a government shutdown; a discussion about funding the border wall will happen "after the election"; and repeal and replace "would be difficult to achieve" in this Congress. "We are still in favor of the wall," McConnell said. "We still want to get funding for the wall, but we think the best time to have that discussion is after the election." In July, House Speaker Paul Ryan (R-Wis.) said Trump was willing "to be patient to make sure that we get what we need" so the wall can be built. Ryan said it was a question of when, not if. The appropriations bill, which passed 93-7 on Tuesday and now goes to the House, provides $674.4 billion in military spending; and $178.1 billion for the Departments of Labor, Health and Human Services, and Education and Related Agencies (including Planned Parenthood funding). The bill also includes $3.8 billion to combat the opioid crisis, which Trump says would be curtailed by a border wall. President Trump drew cheers at a rally in Montana earlier this month when he said, "If it was up to me, I would shut down government over border security." Days earlier, on July 29, he tweeted: "I would be willing to 'shut down' government if the Democrats do not give us the votes for Border Security, which includes the Wall! Must get rid of Lottery, Catch & Release etc. and finally go to system of Immigration based on MERIT! We need great people coming into our Country!" Congress passed an omnibus appropriations bill in March giving the president $1.6 billion for border security, which Trump called a "down payment." But the money was restricted to “fencing” and “levees” on the Southwest Border, not the tall, sturdy kind of wall that Trump wants.